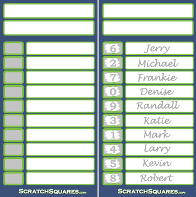 The 10 Line Super Bowl Scratch Cards are perfect for a quick and easy pool with 10 people or less. We typically use 25-50 of these at our Super Bowl Party. This creates a lot of different winners and everyone, even the women :), stay tuned into the game. 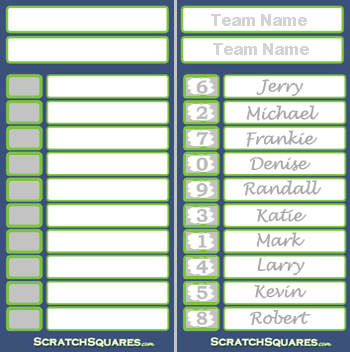 Write the names of the two teams in the spaces provided, then have the participants of the pool write their name on the line or lines of their choice. Once the lines are full, scratch off the covering to reveal the numbers. 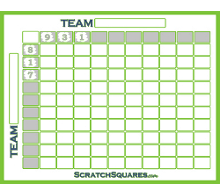 To determine a winning square, simply add the scores of both teams and use the last digit of that total. 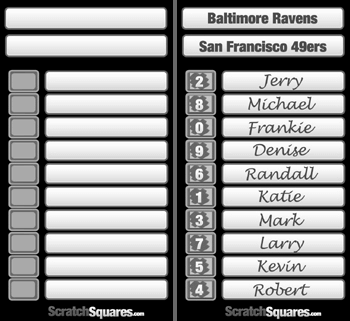 Example: The Ravens have 13 and the 49ers have 3. The winner would be the person with their name beside the number 6(last digit of 13 + 3 = 16). A typical game should have four winners, one for each of the first 3 quarters and one for the final score. Alternatively you could just have a winner for the final score or a winner at halftime and at the end of the game.